You have to run a gauntlet of about two hundred meters of densely packed restaurants and their touts no matter which way you approach the impasse. 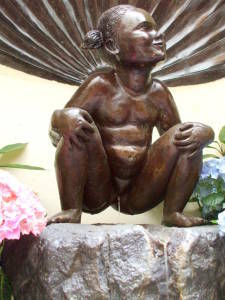 Directly across the impasse is Jeanneke Pis, one of the several famous peeing statues in Brussels. 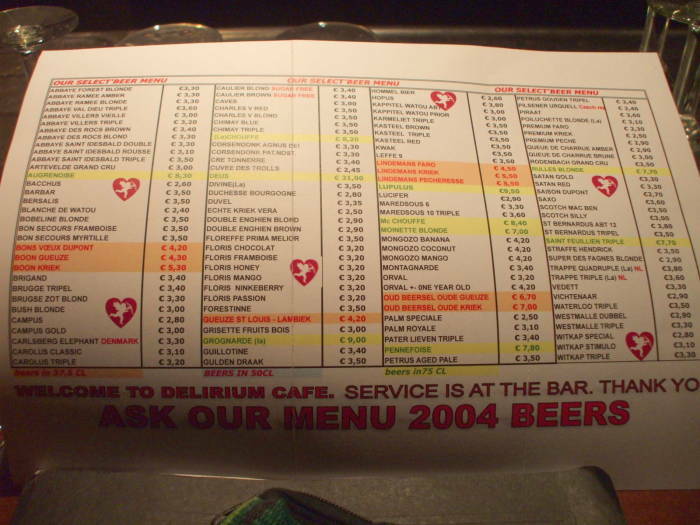 The cafe's big marketing pitch is that in 2004 they got themselves listed in the Guinness Book of World Records for having the greatest number of beers on their menu. 2,004 of them in the year 2004, and more have been added since. The bartender described it as "about 2,500". "Well over 2,000" should be close enough, you aren't going to notice a few dozen more or less. Although I had over 2,000 other choices, I thought I probably should get the house brand first, since I was there. 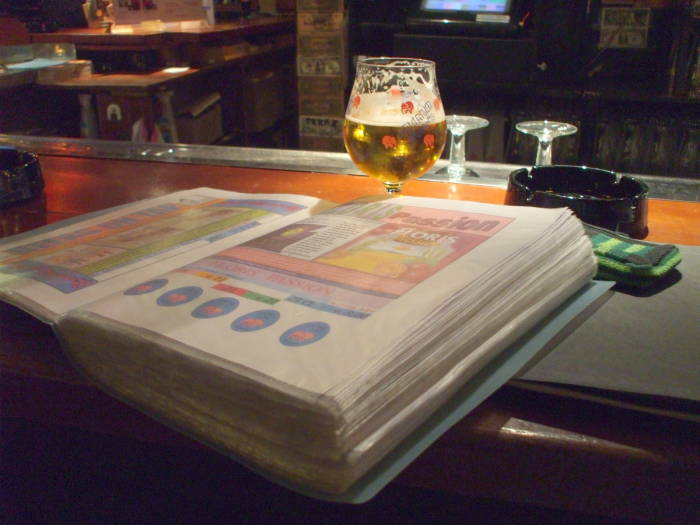 Here is a glass of Delirium Tremens next to the enormous beer menu. Despite the huge number, there is still the traditional Belgian attention to detail. 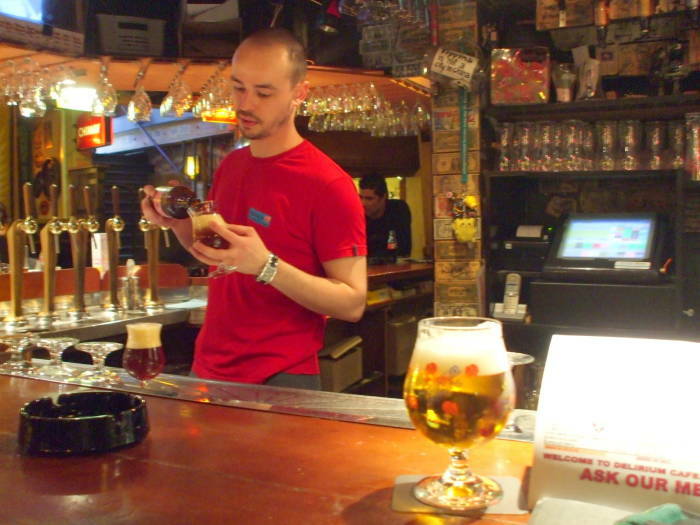 Every beer is carefully poured into its specialized glassware. Below you see the bartender pouring a dark Trappist into a tulip shaped glass. 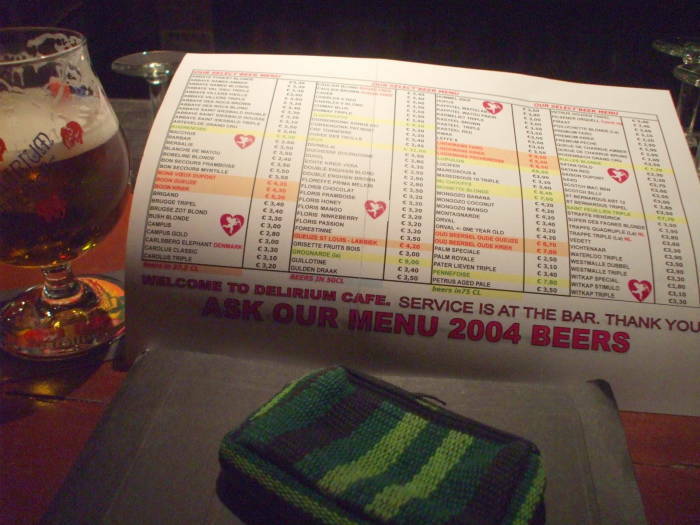 The menu is like a big-city telephone directory, three to four cm thick. But if you have any questions, just ask. The bar staff has encyclopedic knowledge. As you might well imagine, the atmosphere here can be rather different from the other cafes we've visited so far. This bar gets a lot of tourists, and things can get loud, crowded, and boisterous. The upstairs bar has twenty or more taps and it was the one much more filled with rowdy tourists, at least when I was there. The downstairs bar, with the 2000+ bottled varieties, had a more pleasant atmosphere. 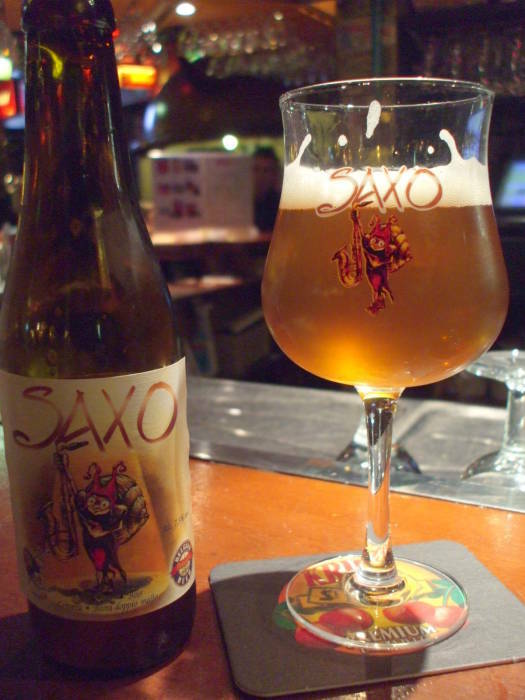 This is a Saxo, a blonde pale ale from Dinant, 7.5% abv. Dinant is the birthplace of Adolphe Sax, the inventor of the saxophone. Next — If over 2,000 varieties of beer isn't enough, how about several hundred varieties of absinthe?